Thanks to the video recording capabilities found in camcorders, digital cameras, and mobile devices, many live events are captured in stunning detail. Aviation performances are no exception. Once only documented by professional photographers, amateur videographers are often in the right place and at the right time to record spectacular moments. 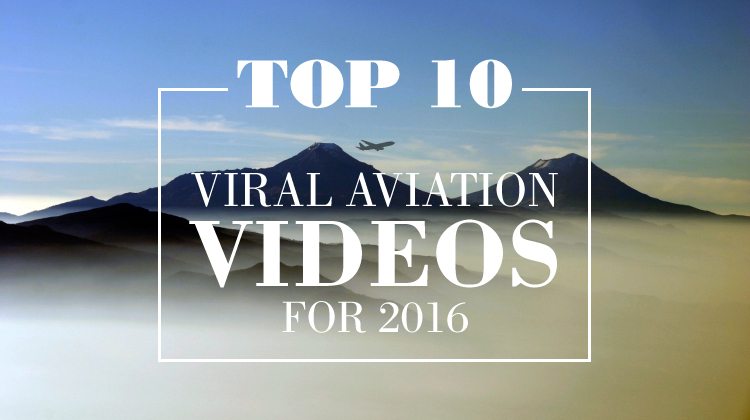 Some of these videos went viral and are now included in Jettly’s E-news. Prior to the start of the 2015 Paris Air Show, the pilots of the massive jet liner put the craft through its paces. The first feat involved an amazing ramp exit with the nose pointing nearly 90-degrees toward the heavens. The practice flight is then followed by extreme banking and dives. Despite the size of the plane, the skilled aviators manage to maneuver the Dreamliner in such a way that it resembles the graceful flight of a bird. In commemoration of the 70th anniversary of the Victory in Europe Day, TBM Avenger pilots were in formation and preparing to fly over Washington. However, smoke began appearing in the cockpit of one of the planes. The pilot’s head cam captured the event as it transpired. Calmly opening the windows, he maneuvered the plane and landed perfectly at the Ronald Reagan Washington National Airport. During this time, his rear-seat passenger was busy locating the site of the problem, which was a pinhole leak in the hydraulics. Little four-year-old Lea Langumier had been flying with her pilot father since the age of two. However, this flight was special. It would be Lea’s first aerial acrobatic experience. A strategically placed camera caught all of the youngster’s reactions. During takeoff, she appears almost bored. Then, papa Raphael makes a vertical climb to the squealing joy of the girl. She begs for more. Again the plane climbs and again the child displays sheer delight. A later complete inversion is also met with excited approval. Aeronautics company DLR, Grenzebach Maschinenbau and KUKA won the euRobotics Technology Transfer Award for the simulator that looks like a massive mechanical arm attached to the cockpit and nose of a Diamond DA 40/42 aircraft. Effortlessly, the robotic arm maneuvers the cockpit to mimic the motion of actual flight while the walls of the room display a live-action video, which gives the illusion of reality. During simulated flight, pilots control the simulator through take-offs, over various terrains and through weather conditions before landing on the runway of an airport. An aerial acrobatic demonstration in Argentina performed by pilots flying single-engine crafts almost goes horribly wrong for one plane and and some boaters during the celebration. The quick video captures the plane buzzing the boat. The landing gear of the Rans S-9 shockingly comes within a few feet of the heads of the three men aboard the water craft. Over the skies of Alberta, Canada, a collision occurred between a Cessna 172 and a Cessna 185 floatplane. The crash proved fatal for the two occupants of the 172. The 185 lost one float while the other dangles from beneath the plane. During the course of the video, the plane overflies the runway and makes an abrupt landing on the grass. The speed and force of the impact propel the plane’s nose downward. However, the pilot successfully and quickly exits the craft. The video begins with the caption, “Some stunts look real, because they are real.” Such was the case of a scene that Hollywood actor Tom Cruise performed while strapped to the fuselage of a jumbo Airbus A400M. Rather than using CGI or stunt professionals, the actor undertook the terrifying event himself. More incredibly, he completed the stunt eight times in order to get the best footage. The pilots of a KLM Asia Boeing 777 managed to maintain control of the aircraft during a dangerous Netherlands storm that produced violent crosswinds. Though the plane rocks from side to side, the crew achieves a safe touch down at Amsterdam’s Schipol Airport in July. The severity of storm was deemed a “Code Red” occurrence by the Netherlands’ meteorological service. During the route from Tracy, California, to Kahului, Hawaii, a Cirrus SR22 craft runs out of fuel approximately 250 miles from the coast of Maui. The pilot anticipated the emergency and notified the Coast Guard who videotaped the event. The single-engine of the plane visibly stalls and moments later, the chute deploys. After hitting the water, the craft remains buoyant long enough for the pilot to exit and board an inflatable raft. The UK is notorious for crosswinds and the video demonstrates the difficulty of achieving a safe landing during the torrential winds at Birmingham Airport. Along with the high winds battling with plane props, the undulating runway adds to the challenge. The skills of several pilots are challenged as a videographer captures front and rear views of different planes. Jettly is no substitute for obtaining a knowledge base from fully qualified and accredited people in your jurisdiction. Our comments and statements are meant to stimulate thought processes that may eventually take you along that developmental path. Our readers should seek advice and knowledge about any and all applicable regulations from qualified people in your jurisdiction.